Peter Goldman’s debut novel is the first in a planned series starring an ex-cop turned PI named Max Christian. Max is not your typical hero of detective fiction. In fact, there’s nothing particularly heroic about him at all; he’s the poster boy for the male midlife crisis. His wife has left him and taken their son with her. He misses his lost past as an NYPD homicide detective. He’s drinking too much. He’s bedding too many women whose names he can’t remember the morning after. He’s having imagined conversations with the ghost of Albert Camus, who nags him—in ghetto street argot—about his addiction to the drug called self-pity. But life changes for Max when an eight-foot-tall black man is shot dead execution-style at his office doorsill. The victim turns out to have been a member of the Darktown Strutters, a touring black troupe putting on exhibition basketball games and blackface minstrel shows in the backwaters of “postracial” America. The murder is the first of several, and Max—initially a “person of interest” to the police—finds himself back in his past, on the track of a serial assassin. He teams up with his old NYPD partner Tina Falcone, and while she chases leads in New York, Max goes underground with the Strutters, nominally as a player with their all-white patsy opposition team and as bodyguard to their coke-addled owner Lou Schiff. With the bodies piling up, he finds himself in a dangerous world in which drug deals and sudden death are routine business transactions and a brutal mob boss calls signals from the shadows. 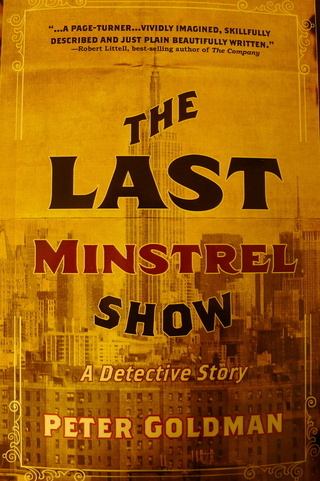 The Last Minstrel Show is first and foremost what its subtitle suggests: a detective story. But it’s an entertainment for serious readers, and, interwoven with the suspense, it raises some serious questions. It looks hard at the persistence of racism in the time of Barack Obama and Trayvon Martin. And it explores the degree to which masks have become a necessity of everyday life for everyone—not just the Strutter minstrelmen performing in blackface. Robert Littell, author of the best-selling The Company and fourteen other novels of espionage and intrigue, wrote that Goldman "has broken the detective whodunit mold, and the legendary writers who made that mold--Ross Macdonald, Dashiell Hammett, Raymond Chandler--would be the first to welcome an original newcomer. The voices in Goldman's novel, white and black, male and female, resonate with perfect pitch. The plot is a page-turner, the denouement spectacular, the whole thing vividly imagined, skillfully described, and beautifully written."